Hawai’i is relentlessly referred to as a paradise—but what does that word really mean? “Paradise” is actually an old compound, coming to English from the Latin paradisus, from the Greek παράδεισος (parádeisos), derived from early Persian (Old Iranian and Avestan) words for “surrounding” and “wall,” or a walled enclosure, which came to mean a cultivated area, a garden. When museum director Stephan Jost suggested to Garden Club of Honolulu members that they use the exhibition Doris Duke’s Shangri La: Architecture, Landscape, and Islamic Art, as a jumping off point for their big Garden Club of America Major Flower and Horticulture Show opening May 8, he didn’t realize the true effect. The show, which includes transforming the Mediterranean courtyard into a Persian flower garden, would essentially create a paradise, in the true, historical sense of the word. It’s all about creating connections, across time and cultures. According to the Garden Club of Honolulu’s publicity chair, Heather Maugham, “The floral designs will reflect the mythical view of Shangri La and Hawai‘i’s uniqueness. The themes for this year’s floral entries are radiance, horizon, waterfall, spirit, dream, paradise, and peace and tranquility.” It’s a positive opportunity to engage all ages and communities, which is why the Garden Club of America decided to make this show one of only three they are holding nationwide this year. There’s also a chance to connect with family, since it’s all happening on Mother’s Day weekend. What mother wouldn’t enjoy perusing more than 200 displays, along with expert commentary provided by the 60 visiting judges, followed by brunch in our café? 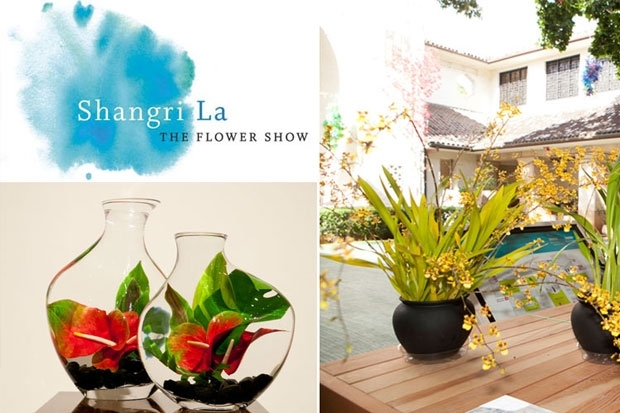 For more on the upcoming Shangri La: The Flower Show, read our blog post on Honolulu Magazine’s website. With less than a month to go, Garden Club members are in turbocharge, making final decisions on the Flower Show’s layout and set-up planning. Here are images from the 2012 Flower Show, to give you an idea of what goes into mounting the triannual event.